So, your parents forbid you to watch the Smurfs and you think that is one of the stupidest things ever, right? But take a breath and think this through with me. Somewhere, down deep inside, you know in your heart that it was when the Smurf high faded, it became the gateway television show that led you to your use of “harder” entertainment media. Come on, admit it. We’ve all heard the stories about Smurf watchers graduating to Harry Potter books and even engaging with others in the sport of Quidditch. I even heard that one poor soul tried out for the position of Seeker. He was last seen in a deserted alley, chasing imaginary Quaffles and Golden Snitches. Clearly it was the Smurfs cartoon that led to your ruin. 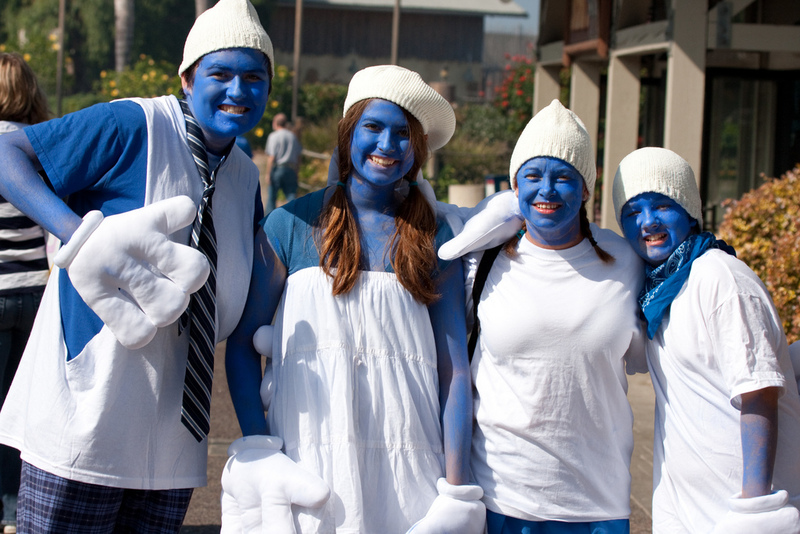 Okay so you’re probably right about the impact of the Smurfs on your childhood. But while we’re on the topic of the position of Seeker… I was on Google+ one time and I saw this post comparing an Egyptian mythological character named Horus to Jesus. The guy who posted it said that the gospel accounts of Jesus’ life were just ripoffs of this Egyptian legend. It seemed pretty compelling so I looked into it further. But the more I read about Horus, the greater the disparity between the legend and the accounts of the Christ. Later I heard the opinion of an expert on ancient literature on the topic. No doubt you’ve heard of J. R. R. Tolkien. His name is often seen lately because he was the author of all things having to do with Hobbits, including The Lord of the Rings and most recently The Desolation of Smaug. Some of you know that Tolkien was not just the author of The Lord of the Rings but also a professor at one of the most prestigious universities in the world, Oxford. But you may not know that he was friends with another professor at Oxford named C.S. Lewis. Lewis was an atheist when he met Tolkien but, after numerous arguments between the two, C.S. Lewis was persuaded to embrace Christianity. Lewis also taught at another prestigious university, Cambridge, where he was the chair of Mediaeval and Renaissance Literature. Tolkien’s friend Lewis made this comment about the writing in the gospels Matthew, Mark, Luke, and John. In other words, this expert in ancient literature believed the gospels to be “reportage.” He believed them to be a true accounting of the life of Jesus Christ. So where did that leave me? I’ll tell you in the next post. It comes out Wednesday, January 15, at 4 AM PST. This entry was posted in Bible Commentary, Bible Study, Seeker and tagged Bible, bible real, C.S. Lewis, God exist, Hobbit, Is Jesus real, J.R.R. Tolkien, Jesus, Jesus copy, Jesus myth by Kurt Bennett. Bookmark the permalink. I remember in 1990 Phil Phillips exposed the problems of the toy and cartoon industry through his book, “Turmoil in the Toy Box”. He encouraged alternative toys for children that would inspire “imagination-gift of God” rather than “vain imagination-deception of Satan”. These blue creatures are what I refer to as 3D (Dem Dead Dudes)—they’re blue for a reason, Hello! They seem to be the same color as Hollywood’s Avatars; Hmmm, I wonder if they’re related. According to Wikipedia Avatar is Hindi for a deliberate descent / incarnation / manifestation / or appearance of a deity to Earth. For clearly their habitation is not with the LOG creatures: Living Oxy Gen folks. Furthermore, they display bad “hobbits” and in their hobbitation they certainly cannot be trusted to give out wholesome information. They invite and tantalize us to join them in laughing all the way to their LOF pool to splash around and have fun, when in reality they draw the LOG creatures into their future LOF (Lake of Fire). There is no eternal home for them with The Creator and His LOG creatures. The Creator is the God of the breathing- walking- definitely living, not the God of the dead! Eventually the Smurf creatures and their companions will have missed their LET in life (Living Eternal Truth) and will LOF their way to extinction…unless they are raised from the dead state they are currently in and given resuscitation by TLW (The Living Word), definitely not Tolkiens Last Word with his ring-a-ling brothers’ circus hoops he’s been jumping through. My take on 3D: DECISIONS DETERMINE DESTINY!